Bromley had a workhouse from 1731 (Peckham, 1999). It was located at the west side of London Road, to the north of Bromley College and almost opposite to what is now Farwig Lane. 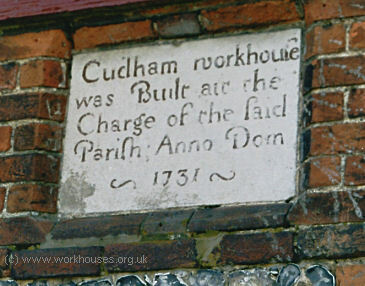 Cudham's parish workhouse was erected in 1731 at Leaves Green. 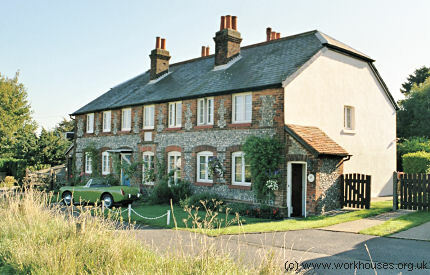 Cudham former parish workhouse, 2004. A parliamentary report in 1777 recorded parish workhouses in operation at Bromley (for up to 80 inmates), Beckenham (35), Chislehurst (17), Cudham (35), and Hayes (20). County of Kent: Bromley (2), Beckenham, Chelsfield, Chislehurst, Foots Cray, North Cray, St Mary's Cray, St Paul's Cray, Cudham, Down, Farnborough, Hayes, Keston, Knockholt, Orpington, West Wickham. Later Additions: Mottingham (from 1887), Sidcup (from 1925). The population falling within the Union at the 1831 census had been 14,413 — with parishes ranging in size from Foots Cray (population 308) to Bromley itself (4,002). The average annual poor-rate expenditure for the period 1834-6 had been £8,101 or 11s.3d. per head. 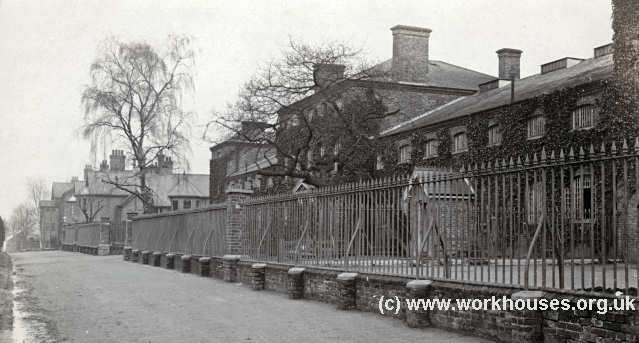 Bromley workhouse from the west, c.1908. The site later became Farnborough Hospital, now the Princess Royal University Hospital. The chapel in now the sole surviving workhouse building. By the 1920s, the Bromley Union was operating a number of scattered homes at Farnborough, although their exact locations have not been identified. The union also placed children at the Holborn Union's schools at Mitcham. Bromley Local Studies Library, Central Library, High St, Bromley BR1 1EX. Holdings include: Guardians' Minutes (1836-1930); Ledgers (1836-1930, with gaps); Births (1879-1936); Deaths (1907-1932); Admission & Discharge books (1882-1930); Apprentice Register (1882-1912, 1927-1930); Registers of lunatics (1899-1931); Letters books (1872-1931); Vaccination registers [1895-1921].